Known as one of the super food, loaded with antioxidants, broccoli comes from the cruciferous family. It is more of an exotic vegetable in India and is being appreciated slowly and steadily all over the world for its flavor. The glycemic index of broccoli is 15 which falls under low GI range. This is best understood by Glycemic load which is estimated to be around 1 for 1 cup of broccoli. It has numerous health benefits. Is Broccoli safe for Diabetics? When planning a diabetic meal plan, it is very important that you include enough servings of vegetables to manage your blood sugar levels. Broccoli is one such vegetable which is considered healthy for diabetics because it is very low in carbohydrates (6.7 g of CHO in 1 cup of broccoli). This makes the glycemic load of around 1 which is extremely low. Broccoli provides you a package of protein (4.6) and fiber (2.2) due to which the absorption of nutrients is slow and gradual. 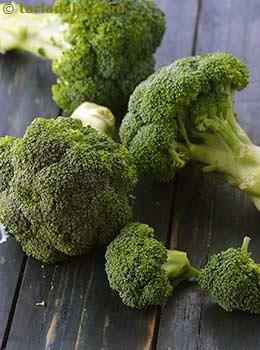 Broccoli is known to be anti- hypertensive due to its low sodium and high potassium content. It is an excellent source of vitamin A that helps to manage insulin release and energy equilibrium. Broccoli contains good amount of vitamin C which is an antioxidant. Thus reduces inflammation in our body. Is Broccoli suitable for Weight Loss? Controlling your portion size is very important in managing your weight. Fruits and vegetables forms a major part of your diet when you wish to lose weight. This is because of its low calorie content. As 1 cup of broccoli contains only around 26 calories, it is the best choice to include for your weight loss goals. Not only this, it is also packed with other essential nutrients such as protein, fiber that helps you feel satiated. Thus controls your appetite without remaining hungry. Fiber also slows down the secretion of the hormone called ghrelin that makes you experience hunger. It is advisable to cut down on extra calories and burn more, limit your portion size at a time and regular physical activity is a must. Have this super healthy Grilled Broccoli for weight loss.